As the year draws to a close, many people turn to reflections on the previous twelve months, to lessons learned. Well I can tell you what mine is.... always check the canning/bottling or best before dates when buying hoppy beers! I picked this can up about two weeks ago but for various reasons I hadn't yet had a chance to try it out. Still I thought, even though it says to drink fresh on the can, how long could the shop have had it prior to me buying it? Well when I noticed that the best before date was less than three weeks away, I feared the worse... and these fears were confirmed when Time and Tide replied to my tweet. This can of beer was around five and a half months old! I'll admit to being left feeling slightly crestfallen at this point. I had loved my only other Time and Tide beer (the amazing Kraken Coffee Stout) and didn't want to have a review compromised by a beer not at it's best. Well I was actually pleasantly surprised. There's no doubt that in the glass it looks lovely. If you follow the instructions and leave the last few drops in the can then it has only a slight murk to it, with a lovely cotton coloured head that does a decent job of hanging around. With a reasonable amount of carbonation and a medium body it has a satisfying mouth feel. The nose had a pineapple sweetness to it, along with cut grass and a resinous pine. Despite being over five months old it drank very well; there was a grapefruit tartness to it and the pine carried through nicely from the nose. Then the finish brings a nice level of dry bitterness. It may not have been at it's best but this can of Calista was still a very tasty IPA and I'll make sure that I try it fresher sometime in 2017. So Time and Tide are two from two in terms of reviews, I look forward to trying more of their beers as soon as possible, especially their Double Stout as that sounds right up my street! As the dust settles on 2016 I can reflect on not only a great year of beer discovery but also the first five months of this blogging project. There have been some unquestionable successes (my beer exposure is increasing every day) as well as some areas where my focus has been lacking (there has been far more beers than barbells!). 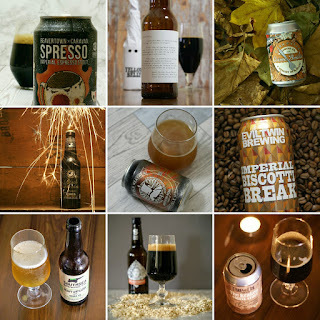 In this review I have shortlisted the nine beers that I have enjoyed the most this year; they may not all be ales that have been first released this year but all are beers that I have been reviewed in that period. There is no specific order to these with the exception of the last one which is my beer of the year. A beer where as far as I'm concerned, the hype was well justified. An absolute monster of a peanut butter biscuit stout that is amazingly well balanced. Superb. Unashamedly boozy and like swigging a luxurious Irish hot chocolate, a perfect autumnal drink. Genuinely like a desert in a can, boozy but with lovely vanilla, coffee, sugar and toffee notes. An outstanding stout. My first experience of Evil Twin brewing and it blew me away. So much boozy flavour packed into one can! A wonderful coffee stout, Kraken was a revelation. Created using cold brew coffee, this was like drinking a flat white. Just one of a number of great beers by Beavertown that I have sampled this year, Spresso is very good coffee stout. Siren have made some amazing beers in 2016 and nearly had at least two more in this list. Broken Dreams is an unctuous breakfast stout which is almost like liquid tiramisu. This was so close to being my beer of the year! I sampled this in the same week as I first tried a Cloudwater DIPA (V9) and it's my opinion that Heavy Artillery is just as good. This really is an outstanding beer. With the world going crazy for East Coast USA Double IPAs it's comforting to know that UK breweries are more than holding their own. Northern Monk absolutely smashed it this year and in Double Heathen they created a juicy hoppy masterpiece. Welcome to the party pal! The second part of my Christmas Eve review double header and it's an absolute belter. I'm not handing out awards for best beer name ever, but if I were, "Christmas Eve at a New York City Hotel Room" would have to be in contention. So it's kind of a fitting that the beer inside the bottle is pretty special. It pours thick and black with a mocha coloured head that hangs around for a while. The nose is about as subtle as the Griswold's Christmas lights, with black treacle, liquorice and biscuit hitting you square in the face. The mouth feel is thick and luxurious, coating your tongue and throat on the way down. The taste delivers on everything that the nose promises; the black treacle and liquorice follow through boldly, with hints of the vanilla sweetness making a brief appearance. This is then all blown away by a finish so boozy and grown up that there's actually an unapologetic moment of burn that then fades into the festive night as quickly as it came, leaving you ready for more. Christmas Eve at a New York City Hotel Room offers everything that you'd hope for in an Evil Twin Imperial Stout and I loved it. Just a couple of quick reviews tonight to make up a cheeky little Christmas Eve double header. First up is Black Christmas by Weird Beard, a cranberry Christmas Stout weighing in at a very sessionable 4.5% ABV. It pours a lovely jet black with a creamy coloured head that doesn't last long. The nose is very festive, with red fruits, vanilla and hints of cocoa giving it the aroma of a wintery pudding. The mouth is light bodied, as you'd expect from a beer of such a low ABV; this is not a thick luxurious stout. On tasting, there is a hint of sweetness up front, but in flash it's gone. What's left is a cranberry fruit sourness that seems completely at odds to what you'd expect from a stout. But it works! Whilst the flavour may not offer everything that the nose hints at, it refreshes in a way that dark beers normally wouldn't. It is very easy drinking and I'm a little sad that I don't have another bottle to drink with my Christmas lunch tomorrow. 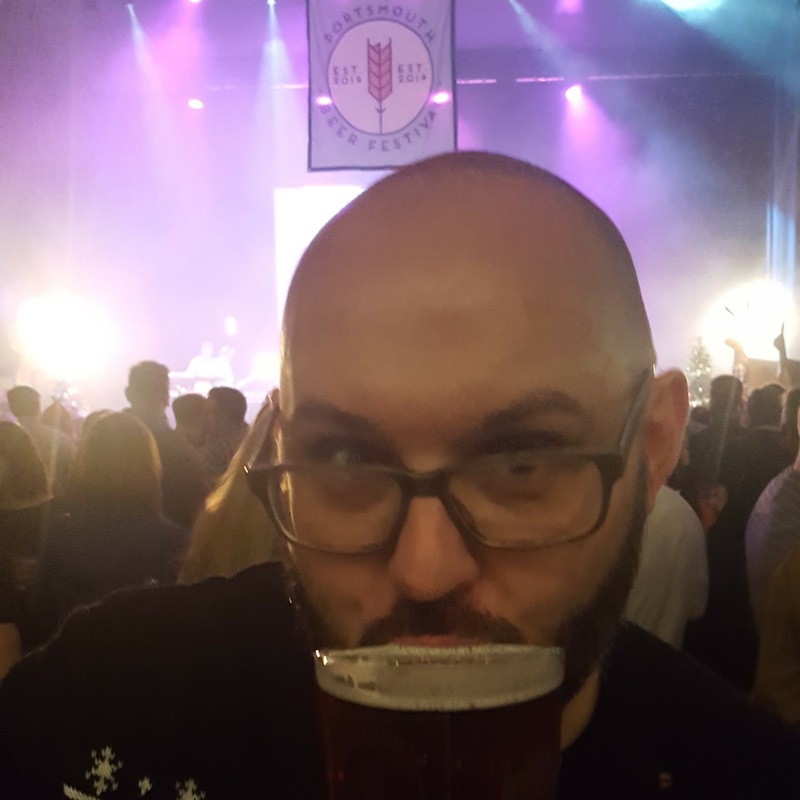 So now that my head is cleared it's time to reflect (and try to remember) my night at the Portsmouth Beer Festival on Saturday 17th December. It's actually the first of their events that I've attended, as my shifts just haven't worked out previously. I attended the Saturday evening (6pm to 11pm) which was the third and final session. So what did I like about the event? Well first of all, it was great value. Tickets were only £10.50 which included a souvenir glass to use at the event and keep (pint or half pint, your choice) and one free beer token. Then the tokens themselves were £21 for twelve; with one token then worth a half pint of any beer inside. My maths tells me that means you're paying £3.50 a pint, which I accept doesn't include your entrance fee, but I think still offers pretty good value for money. The fact that you buy your tokens on the way in means that there are no cash transactions at the bars, which then means very quick serving time. I don't think I ever waited more than around three or four minutes to get served, which when you consider that this event was a sell out is excellent. The bands that I saw in the Saturday night sessions were very good. Local band Winters Hill kicked off and their folk/rock sound was perfect for the event. Dirty Diesel Outlaw Orchestra were a raucous delight and the headliners Fleetingwood Mac wowed with a host of well recognised crowd pleasing numbers. But my personal favourite were Steel Strum. This was the second time I'd seen them at a beer festival and their steel drum instrumental versions of an eclectic range of covers was amazing. There was also something very amusing about watching people's faces as they tried to work out what track the band were playing... you're just not used to hearing an Usher song played on a steel drum and it sometimes took a while for the penny to drop! Food options were pretty good and whilst the £5 I paid for the hot dog from O'Haggan's BBQ may be a little steep, there is no denying that the Pork and Plum sausage inside was top notch. On reflection I've paid more for less quality at other events. I know that some comments made on a craft beer forum had been dismissive about the range of beers on offer, criticising the 'safe' nature of the selections and the lack of any stronger Double IPAs or Imperial Stouts. 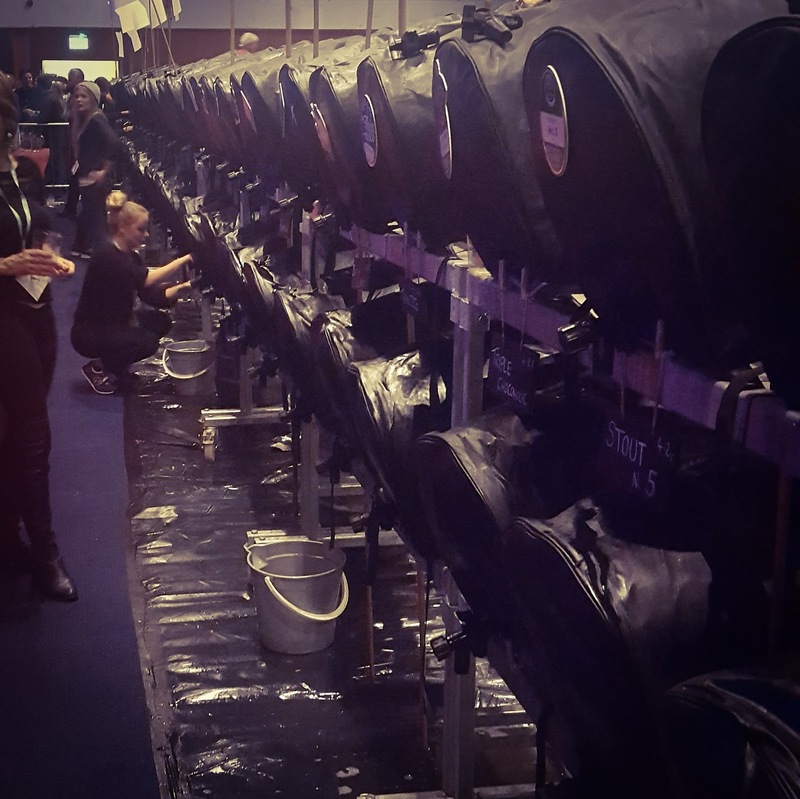 However I actually think the selection was pretty spot on; although there was a lot of traditional real ale offerings there were also representations from some very forward thinking craft brewers. There really was something for everyone. The extra hoppy StaggerSaurus that Staggeringly Good brought along was a juicy hazy delight and I hope is something they do again (maybe for Warriorfest?...). Southsea Brewing's Casemate cemented itself as one of my favourite IPAs and we really are lucky to have another great brewery on our doorstep. Wild Beer's Bibble proved itself to be a cracking session Pale Ale. Crème Brule by Darkstar was even better by cask than it was by can. Bristol Beer Factory's Milk Stout was a dark creamy unctuous wonder. The biggest issue was that it wasn't too far into the Saturday evening session that some beers started to sell out. Getting the quantities right must be near on impossible, however to have something as amazing as Dark Star's Crème Brule sell out so early was hugely disappointing. I've also seen on the Facebook feedback that a number of the ciders sold out very early. I don't know what the solution is but when the Saturday evening session is first to sell out, steps need to be taken to ensure that those attending don't feel like they are missing out. Also, the acoustics seemed slightly off as for two of the bands it was difficult to make out the vocals above the instruments. When you've got such good acts performing it's a shame not to be able to get the most out of them. But these two points are only meant as feedback as I had a cracking time, I think it was a huge success and will definitely do my best to attend again in the future. If you did a survey asking craft beer lovers to name their favourite stouts, you wouldn't have to wait long before hearing the words Ten Fidy. This imperial stout by Oskar Blues is all over instagram and when I saw it for sale on Beer Gonzo recently there was no way that I wasn't going to place an order. This particular can is over a year old (canned in November 2015 according to the stamp on the bottom) but due to the nature of the beer, that does not concern me. It comes out the can thick and gloopy like crude oil, and with a heavy pour produces a large head that looks like cinder toffee. This doesn't hang around long though, leaving a dense shiny mass in the glass. Ten Fidy has a heavy aroma, think with toasted malts with hints of vanilla. In the mouth it is as thick as the pour suggested it would be, coating your tongue as it passes. Ten Fidy is not subtle, with everything from the nose following through into a bold boozy mouthful that leads into a black treacle finish. You can taste all of the 10.5% ABV (and a little bit more if I'm honest) but I love that. Ten Fidy is a cracking imperial stout that every lover of dark beers should try at least once. Well the Christmas tree is up and the house is looking festive and cosy; it's cold outside and the last two mornings has seen some heavy frosts. It's definitely stout weather.... so why have I got so many IPA's on my shelf to get through. I realise that it's a bit of a first world problem, but I do appreciate that some beers do not age well. Therefore, amongst some of the darker beers in my collection I'm going to tick off a few of the lighter beers... who knows, maybe it'll help stave off seasonal affective disorder. Tonight's is one that I was particularly excited about as everything I've had from Evil Twin has been outstanding. Falco is an IPA weighing in at 7% ABV and in the glass it almost looks like a lager; it's a beautiful amber colour, with an ever so slight haze and a crisp white head which does a decent job of hanging around. It has a wonderfully strong but clean nose, with grapefruit and pine being the dominating aromas. Falco's medium body and nice level of carbonation gives it a lovely mouth feel. It taste's amazing; the citrus balances beautifully with the malts, and a slight pine resin spiciness rounds it out before a very satisfying bitter finish. Falco is hugely drinkable and is a cracking example of this style of IPA; there's nothing ground-breaking in this beer and it's not as flashy or unusual as some of Evil Twin's offerings, but that doesn't mean that it's not spectacular. This is one that I would definitely buy again.